What distinguishes a Catholic School from other private and public schools? We pride ourselves on academic achievement, a culture of supportive and dedicated teachers, and setting our national, state and diocesan benchmarks high. However, many other schools can attest to these same goals and characteristics. The mission statement of St. Anastasia Catholic School reminds us that we are a part of a large community of believers who are hopeful that Christ’s message will shape the lives of our children. We believe that each child is unique and is created in the image of God. We support our families in the nurturing of more than just the child’s mind. It is our duty to develop the body and the soul of our children as well. School liturgy, daily prayer, religious education, Catholic Sacraments, service days, retreats, competitive athletics, family picnics and many other formation opportunities all contribute to an environment that is guided by the Spirit and not by governments or the random demands of our society. Thank you for entrusting your most valuable creation to the family of St. Anastasia. Thank you for your involvement in your child’s education. Thank you for investing your time, talent and treasure in the development of the future Christian leaders of our community. Please remember St. Anastasia in your daily prayers. The St. Anastasia Catholic School and Church Community believes each student is a unique child of God who is called to be a disciple of Christ, a reflective and critical thinker, a responsible citizen, and a healthy and balanced child. We are a community of faith, called together to share our time, talents and treasure to further God's mission here on earth. Seeks out God in sacraments, prayer, service, evangelization, and worship. Understands how to use the Bible and Catechism to inspire and inform his/her faith. Knows how to apply human and theological virtues and can defend what he/she believes. Strives for a deepened respect and appreciation for truth, beauty, and goodness. Demonstrates understanding of facts and ideas in all of the academic disciplines. Uses the latest technology and information to solve complex problems. Demonstrates curiosity by asking what, why and how. Listens well and communicates effectively and creatively. Respects and cares for all life and God's creation. Demonstrates accountability to himself/herself, to God, and to the community. Understands his/her unique talents and challenges and applies that self-awareness in the development of personal goals. Continuously develops his/her basic life skills, social etiquette, and ability to adapt to change. Stands up to peer pressure and makes good choices with help from God, family, and the community. Appreciates the importance of nutrition, hygiene, self-discipline, posture, and overall wellness at home and at school. Participates in extracurricular activities and exhibits good sportsmanship and teamwork when working or playing in a group. Recognizes the benefits of a healthy lifestyle and makes choices that support the value of his/her life and the lives of others. Sets measurable goals to continuously balance his/her health and wellness. Located in St Lucie County, St. Anastasia Catholic School serves its parish as well as other parishes of the Diocese of Palm Beach including Holy Family, St. Lucie, St. Mark, St. Elizabeth Ann Seton, St. Martin de Porres, St. Bernadette, St. Helen, Holy Cross, St. Joseph, Holy Redeemer, St. Sebastian and Notre Dame Mission. St. Anastasia Catholic School had its beginnings in 1914 when Father Gabriel Ruppert, O.S.B. had it built on Orange Avenue and 10th Street in Fort Pierce. From 1919 to 1924, the St. Lucie County School District used the facilities free of charge. In September 1926, the Sisters of St. Dominic of Adrian, Michigan came to staff the school. Sisters Generosa Solon, Jane Francis Woelkers and Sabina Mack opened the school to 52 students. As the student population grew, so did the need for the buildings. In 1932, St. Anastasia added its first year of high school. 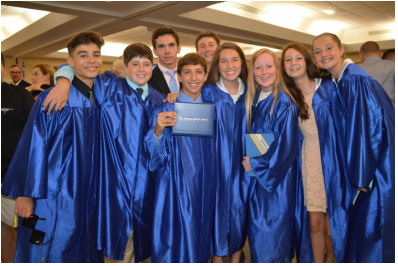 Each subsequent year witnessed the addition of another class and by 1936, St. Anastasia had all four grades of high school and its first graduating class graduated five students. Addressing the needs of black students who wanted a Catholic education, Blessed Martin School on Eighth Street opened its doors in September 1940. In 1951, St. Anastasia’s total enrollment had grown to 201 students that included grades one through twelve. 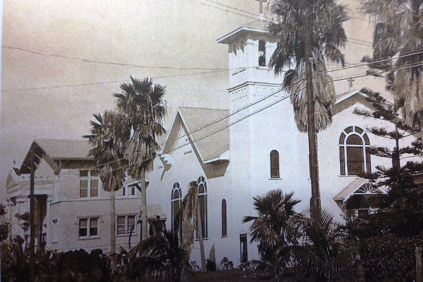 By 1960, St. Anastasia Catholic School has expanded its elementary school to a new location on 33rd Street in western Fort Pierce and the St. Anastasia School building on 10th Street served as the high school. At that time, St. Anastasia Catholic School became racially integrated and Blessed Martin School closed its doors. In 1962, the Bishop designated the high school a diocesan high school. Three years later in 1965, the present John Carroll High School on Delaware Avenue opened its doors. Five years later in 1970, Father Michael Beerhalter directed that three portable classrooms be added to St. Anastasia Catholic School’s campus due to increased enrollment. By 1980, Father Edward Condren added three additional classrooms to meet growth demands. For the next 16 years, St. Anastasia had many new facilities come to fruition due to the efforts of Father Mark Christopher. In 1983, he added two kindergarten rooms and the former convent became the Monsignor Beerhalter Media Center housing the school library, guidance office, art room, development office, religion resource room small devotional chapel, Title I Program and enrichment program. By 1989, Father Christopher had a state-of-the-art computer laboratory and a spacious music room constructed to form the Media Center’s east wing. A sports pavilion was erected to enhance the school’s physical education and sports program in 1991. In 1993, the completion of the Bergalis and Wolf buildings created eight new classrooms. These additions have allowed St. Anastasia to meet the enrollment demands by offering two classes each of kindergarten through eighth grades. To meet administrative needs, the Alice M. Clark Administration building was constructed in 1997. In order to enhance the Band Program at St. Anastasia Catholic School, the multi-faceted Louise Beerhalter Band Room was constructed in 1998. Today, over one hundred students in grades five through eight are actively involved in the Band Program. Under the leadership of Father Michael Woodcock as pastor, campus expansion continued. Four additional classrooms were constructed adjacent to the Administrative Offices providing space for classrooms to be relocated. In 2000, St. Anastasia Catholic School welcomed Pre-School students for the first time. In 2006, a state-of-the-art Media Center was completed. The plans for this facility had been many years in the making under the leadership of Father Woodcock, Father O’Toole, Father George, the present pastor and the school administration under the leadership of Mrs. Vickie Guettler and Mr. Thomas Boedicker. Since its inception, St. Anastasia Catholic School has grown under the administration and guidance of the Sisters of St. Dominic of Adrian, Michigan. Former principals of the school include: Sister Kathleen Marie Barry; Sister Grace Agatha Dillion; Sister Mary Catherine Jordan; Sister Evangeline Marie Loveridge; Sister Anne Elizabeth Monahan; Sister Jean Renuart, Sister Mary Ann Rissert; Sister Laura Simmons; Sister Generosa Solon; Sister Mary Eleanore Unvarsky; and Sister Clare Daniel Watson. A Sister of the Order of St. Ann served briefly until Mrs. Vickie Guettler replaced her in 1982 as the school’s firs lay principal. Mrs. Guettler continued to serve in that capacity until 2004. Mr. Thomas Boedicker assumed the leadership role of the school in 2004 through 2007. Dr. Kevin Hoeffner is the principal of St. Anastasia Catholic School today.